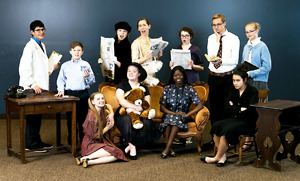 WINONA LAKE – Lakeland Christian Academy will present “The Curious Savage” by John Patrick this weekend. Times are 7 p.m. Friday and Saturday, with a matinee at 2 p.m. Saturday. Performances will take place at Lakeland Christian Academy, 1093 S. CR 250E, Winona Lake. Tickets will be $6 at the door; the doors will open at 6:30 p.m. In the play, Mrs. Savage is an elderly woman whose late husband has left her $10 million. She intends to give the entire fortune to people who wish to pursue their “foolish dreams,” but her stepchildren strongly object. To prevent her from doing away with the family’s wealth and ruining their legacy, they have her committed to a sanatorium called The Cloisters, and it is among the gentle residents there that she finds her true family. The cast includes Aliesa McCrum as Mrs. Savage; Savanna Goss as Fairy; Lyness Mudilla, Florence; Ryan Gormaly, Hannibal; Mason Roesner, Jeff; Tori Calizo, Mrs. Paddy; Adrian Bowdler, Dr. Emmitt; Kathryn Monsma, Miss Willie; Carly O’Hara, Theadora Savage; Abigail Burns, Lily Belle Savage; and Angella Stichter as Samantha Savage.